PASIR GUDANG, JOHOR, 15 Nov. 2010 – Taman Chendana, a housing estate for the lower and middle income groups, has been declared as UKM’s adopted housing area to enable the university to carry programmes aimed at helping the people there especially in education and health care. 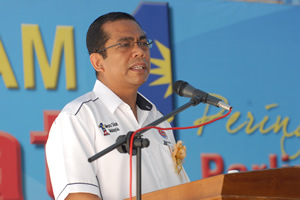 Minister of Higher Education, Dato’ Seri Mohamed Khaled Nordin, made the announcement at the closing ceremony of the 1Malaysia Health Programme at the housing estate here yesterday. Khaled, who is also the MP for Pasir Gudang where the housing estate is situated, hoped UKM can assist in increasing awareness of the people there about the state of their health and education as they needed assistance to meet their aspirations. Such community programmes will also enable UKM students to understand the needs of society and issues confronting the people. Such understanding needed to be nurtured among university students so that they would be willing to take part in community programmes to impart their knowledge for the benefit of society. Present at the ceremony were UKM Vice Chancellor, Prof. Tan Sri Dato’ Dr. Sharifah Hapsah Syed Hasan Shahabudin, Deputy VC (Academic and International Affairs) Prof. Ir. Dato’ Dr. Hassan Basri, Permas Assemblyman, Encik MM Samy and the President of the Pasir Gudang Municipal Council, Haji Abd Rahim Nin. Khaled said the Higher Education Ministry wants university graduates to be imbued with the knowledge and understanding of the various issues, problems and needs of society. That was why the Ministry encourages programmes aimed at exposing students to what the people faced in their daily lives as well as to imbue the spirit of volunteerism among them. He said that UKM as a research university which possesses strength in health education should undertake a comprehensive study on the state of the health of the people of Pasir Gudang. Such a study would be helpful in planning future health programmes for the people. 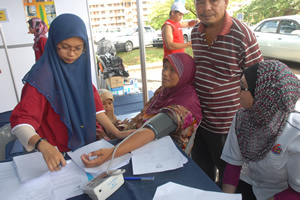 The 1Malaysia 3 day Health programme began on Friday (Nov 12) where health clinics and exhibition on UKM as well as activities to enhance motivation among the people especially the youth and school children were held. UKM’s booth providing medical check-ups and the exhibition were well patronised even up to the closing ceremony indicating the people’s concern about health and and matters pertaining to education.